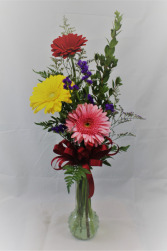 Snaps, Carnations, Mini Carns, Asst Daisies, Statice. Hydrangea, Roses, Alstromeria, Tulips, Solidago Aster, Lily, Waxflower. 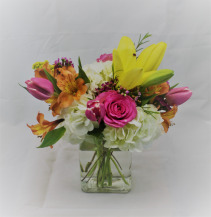 Knob Glass Vase, Gerbera Yellow Or Bright Color, Pink Floyd Roses, Stock, Tulips, Mini Carnations, Bb , Waxflower. 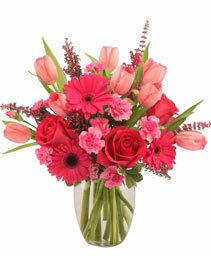 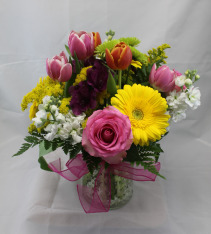 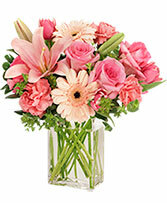 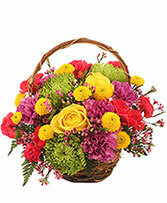 A bright and colorful mix including Gerberas, Roses, Stock, Tulips, Mini Carnations and accents. 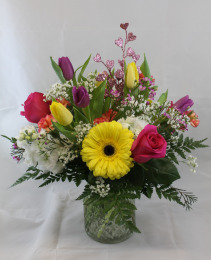 Stock, Pink Floyd Roses, Gerberas, Tulips, Solidago Aster, Alstromeria, Stm Green Mums. 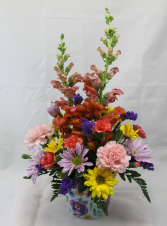 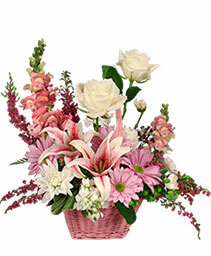 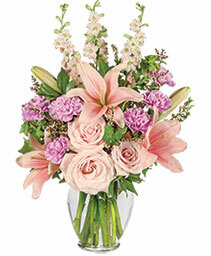 Mom will just love this colorful and fragrant bouquet!